I love when Ray mows the grass. 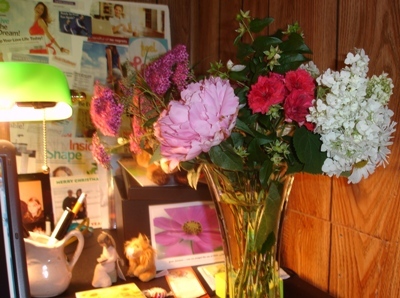 #2, after he mows, Ray often cuts fresh flowers from our yard for a pretty bouquet for my desk, like you see in this pic. Please understand, I’m NOT a huge country music fan and it is a RIDICULOUS song, but it cracks me up to listen to it.) Just something about Ray out there on the green John Deere mower in the sun, in his blue jeans and t-shirt…. Sometimes what strengthens relationships is the little things – a husband mowing the grass or giving his wife flowers, giving your spouse a backrub or a funny card, sharing an ice cream with your child, calling or emailing a friend to check on her, or sharing some encouraging words that someone needs to hear after a rough day. What can you do today to nurture your relationships with God, family, friends, and those around you? What little thing can you do to make someone’s day better?